Race Organizers have changed things up this year, which was needed. Colorado truly is a magnificent state, we have so much natural beauty and so many wonderful mountain towns that I am happy to see new places and roads featured for the 2015 race. *Exact routes and roads will be announced in spring 2015. First impression of the 2015 route (which is conceivable based upon the order of host cities) is a raced formed across long road climbs. The kind of race where team work matters and many new names will be seen on the podium. Still it will be the kind of race where experience trumps all. There are opportunities for a sprinter, for a strong finishing climber, for a time trialist able to manage a twisty climbing course, but especially for a true team leader. To win - your team will have to sacrifice. Overall this will be a very nice week in Colorado. The race begins in Steamboat Springs - a welcoming cowboy ski town northwest of Denver. The following day there will be an early climb over Rabbit Mountain and a final climb to the ski station of Arapahoe Basin (A Basin) - one of my favorite roads to cycle in Colorado (especially the nearby Loveland Pass). Next the peloton will depart Copper Mountain, another ski village, and climb over Independence Pass into the familiar city of Aspen. They won't stay long, the next day the riders climb back to Breckenridge where the 9600'ft elevation individual time trial will take place the following day on Stage 5. This will be a do not miss day in Breckenridge (it's a Friday). Breckenridge is an excellent choice to base the peloton and it's entourage for two nights. As welcoming as Steamboat, the city is even more scenic and excels at hosting large events. After departing Breckenridge the peloton enters the yet unknown; the host cities and route of Stage 6 have yet to be decided. Race Organizers fancy the promotional idea of putting the vote to the people, a repeat of 2014 when they chose to get the people involved in route planning (or so it looks, I never know if they actually have the route fully planned already). I think imagining routes is as fun as riding them - so share your ideas, if it does not impact this year, it might impact next year's route. Where should the race proceed between Breckenridge (Stage 5) and the start in Golden (Stage 7); your route idea must be within 150 miles of Denver. Take into consideration that Stage 6 is on a Saturday, so race organizers will want big crowds and good TV viewing, also the peloton will bed in downtown Denver for the last two nights to ease logistics. The race finish is once again in Denver on a Sunday. 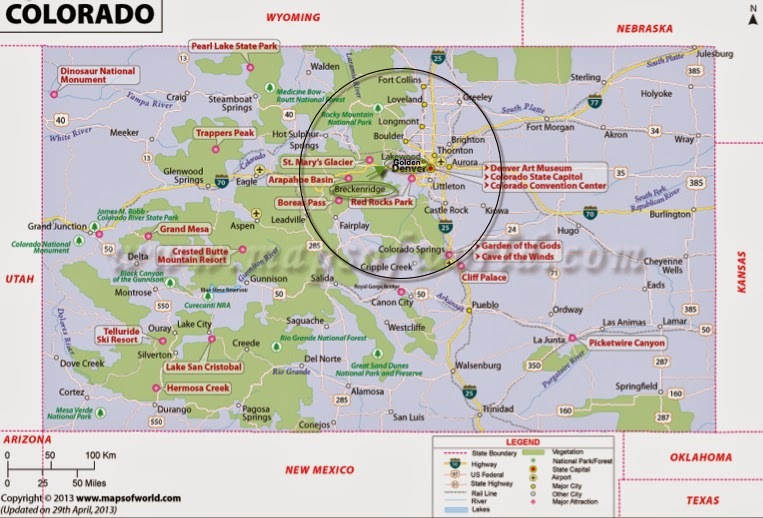 Previous or possible host cities southwest of Denver include Colorado Springs, Castle Rock, Evergreen, Idaho Springs, and Golden. I would like to see the race go up Lookout Mountain again to Squaw Pass and Red Rocks. 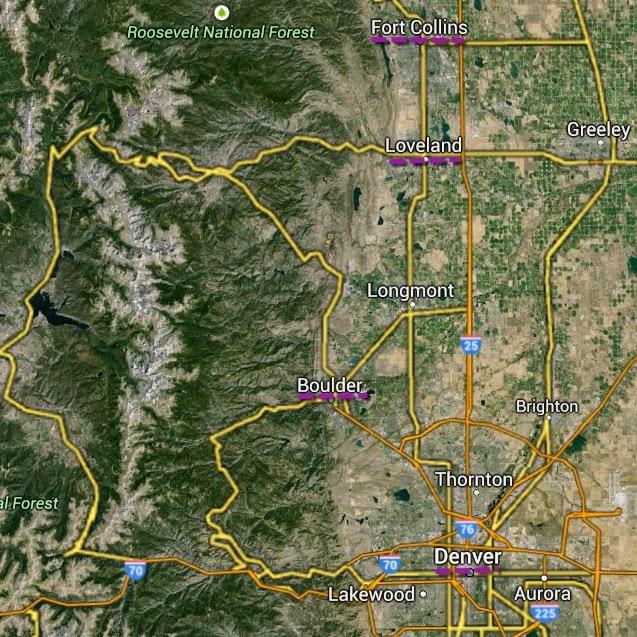 For Front Range Colorado Cyclists - this is our prime stomping ground. Alternatively a stage between the Air Force Academy in Colorado Springs east to the Black Forrest rollers could be a tactically interesting race to watch. 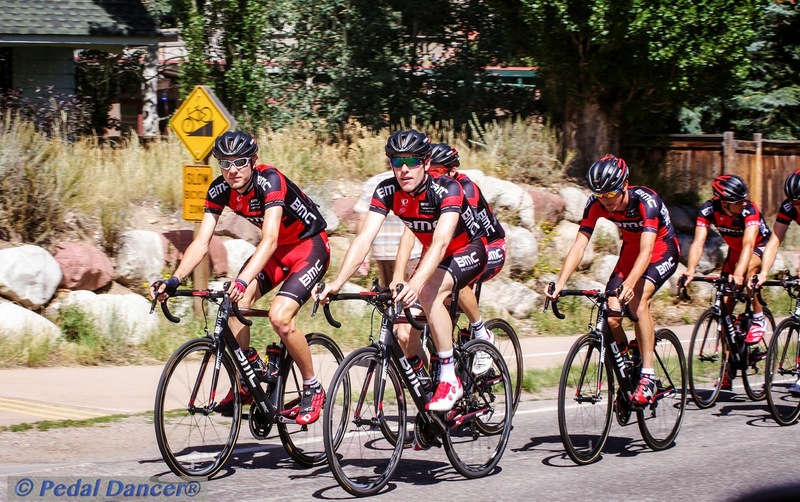 There will be some noise to get the US Pro Challenge back onto Flagstaff mountain in Boulder - which just reopened this week - but Boulder is a very controversial location. My loyalty will always go to Golden or Loveland/Fort Collins for the historical support they have given the race over the years. The Peak to Peak Highway is a scenic byway crossing a beautiful stretch of high country Colorado. 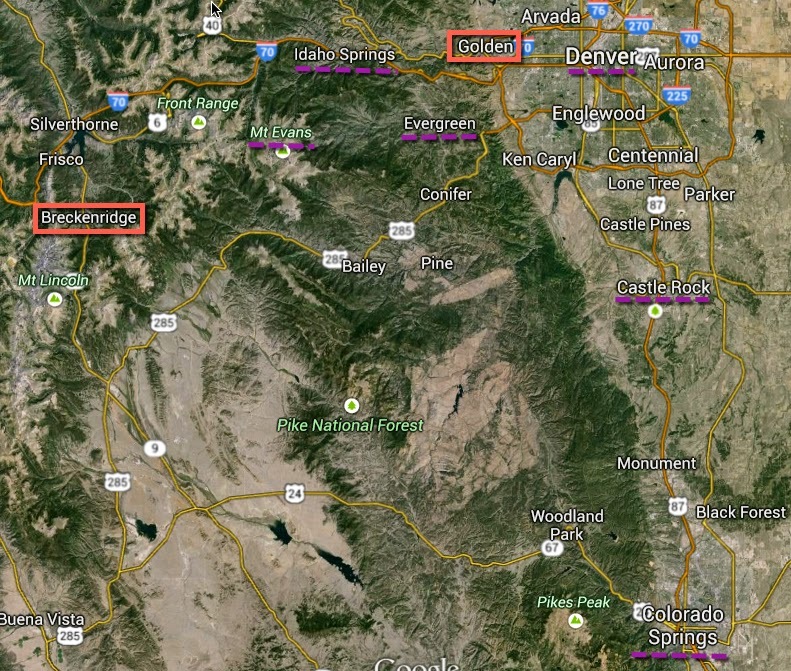 A route from Loveland to Eldora Ski Resort would attract crowds from Fort Collins, Loveland, Boulder, Nederlands, Golden and Denver. I am a fan of shorter pro routes where the racing begins from the start and continues throughout the stage. 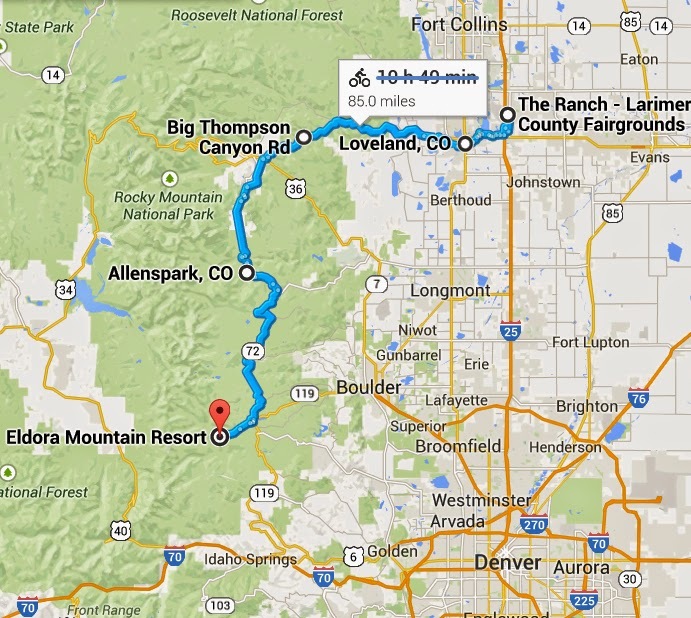 This route would parallel the continental divide north to south and features challenging false flats at altitude. Lakewood - Golden - Lookout Mountain - Red Rocks Park - Morrison - Evergreen - Squaw Pass - Echo Lake - Idaho Springs - Georgetown - Guenella Pass. There will definitely be new teams racing in 2015. Changes have been made to the names, sponsors and ranks in the Pro Teams, Pro Continental and Continental teams. Even the women's teams are reforming for 2015. No announcement has been made yet about additional details of the women's stage race planned in conjunction with the 2015 USA Pro Challenge. Exact Route details will be announced in spring 2015, this is when we will fully discover all the other great small towns the race will visit or pass through next summer. Teams will be announced in the months preceding, with final rosters announced 1 week before the race start. August 17-23, 2015 should be a very nice week to spend on vacation in Colorado. Remember - head to Steamboat Springs early so you can see and ride next to the teams training in the days before the race start! Photo by Karen Rakestraw of Pedal Dancer.